Mobility scooter rules must be clarified and a fit-to-drive test considered, MPs have said, following accidents involving the vehicles. The House of Commons Transport Committee said better figures on the use of scooters needed to be collected. It argued a review in 2005 had been largely ignored and new information needed to be taken into account. The Department for Transport said it was consulting on mobility scooters and whether regulations need to be changed. More than 300,000 people are thought to use mobility scooters in the UK. They can travel at up to 8mph (12.8km/h) and weigh up to 150kg. But there is no compulsory assessment to see if someone is fit to drive one. 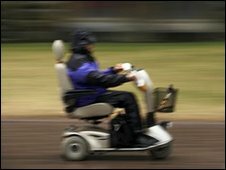 A 90-year-old woman died when she was hit by a scooter in September 2009, and a toddler was injured last year. Last September, 90-year-old Lillian Macey, of Harlow, Essex, died after being hit by a scooter as she walked along a pavement in Sandown in the Isle of Wight. When toddler Madison McNair was run over by a pensioner on a mobility scooter in Doncaster, South Yorkshire, earlier in the year, police said they could take no action because scooters were not classed as motor vehicles. The Commons committee said the increasing use of scooters meant the government needed to assess the scale of the problem. At the moment there is little data on the numbers of people involved, or the seriousness of accidents. Committee chairwoman Louise Ellman said mobility scooters were a "vital aid" for many people in the UK. "We welcome the independence that these vehicles can give people to go about their daily lives," she said. "However, we are concerned about the many reported accidents and injuries involving the scooters. "The government does not have adequate data on either how many mobility scooters are currently in use or on the number and type of accidents in which they might be involved." 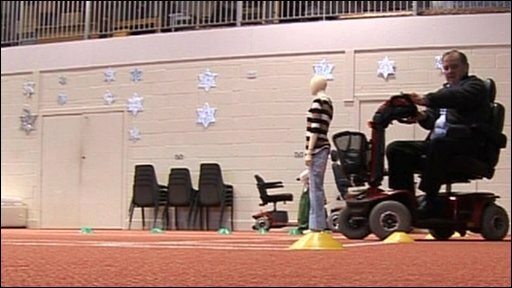 The MPs' report said the 2005 review had made a number of recommendations - for example that scooter users should have third-party insurance, and be assessed for their fitness to drive - but that little was done. It is calling for the government to act on findings by the Department for Transport (DfT). The DfT said in a statement: "The 2005 review concluded that mobility scooters did not pose a significant safety risk to their users or other road users. Class 3 vehicles must be registered with the DVLA. Users do not need a driving licence or have to take a test. They do not have to pay road tax but are supposed to display a "nil duty" tax disc - which is rarely enforced. No registration plates or insurance are needed - though the latter is recommended. "However, with the apparent increase in numbers of use of these vehicles, the department has launched a public consultation. The consultation closes on 28 May 2010." Kevin Clinton, of the Royal Society for the Prevention of Accidents, said: "We welcome the call for data to be collected on incidents involving mobility scooters, because current evidence relating to accidents and injuries is sparse. "The lack of such data means it is difficult to justify introducing new regulations that may be disproportionate to the level of risk associated with mobility scooters. "It is a balance we have to get right, because mobility scooters fulfil a very valuable and important function, helping many people to enjoy a much better quality of life than they would otherwise be able to do."